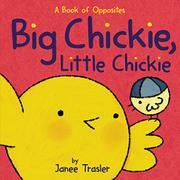 This new volume in Trasler’s popular Chickies series (Bedtime for Chickies, 2014; A New Chick for Chickies, 2014, etc.) introduces opposites. Pig, Cow, and Sheep decide it’s picture time for Chickies. All the animals take part in a boisterous photo shoot, showcasing pairs of opposites along the way. In some instances, the concepts are crystal clear, such as when the text “Chickies in. / Chickies out” is paired with an illustration of the Chickies inside and outside a box of clothing. Other times, the concepts can be tricky. For instance, it may take a while for toddlers to puzzle out the up/down pairing, in which the “Chickies up” illustration features a snapshot of a Chickie in midjump, showing just its bottom half with feet off the ground. “Chickie’s down” catches it on the descent, showing just the top of its head. In a nifty twist, the predictable rhymes and picture-taking session are interrupted with several clever photo-bombs. For example: “Chickies then. / Chickies now. / Chickies dance / and take a… // COW!” The illustration presents Cow in a tutu instead of the bowing Chickies readers might have expected. Bright, bold illustrations, smooth rhyming verse, and clever wordplay make this another Chickie keeper.